Although he is trained in drawing, water colors, sculpture and oil painting, it is the latter that seems to be Bill Kosman’s passion. After a career of working as a journalist and corporate marketing executive on the East and West coasts and in Europe (and many art classes in evenings and summer), he now finds joy as a professional oil painter based both in Philadelphia and Normandy, France. Kosman is hosting an exhibition ‘Hope for the Homeless’ at the Manayunk Roxborough Art Center in support of the Bethesda Project. The Opening Reception is Sunday October 7th from 12 – 3 pm. The show will continue Saturday the 13th and Sunday the 14th from 11 am – 3 pm. MRAC’s Esther Griffin talks with Kosman about his art and his upcoming exhibition. In one way, I live in two worlds when I practice my art of oil painting. In one world, I paint urban scenes in Philadelphia, and I try to show brave people on the streets of the city, confronting life and trying to build a home and a good life for their families in often difficult circumstances. In the other world, I paint landscapes of the beauties of France’s Normandy region – the fields of various crops shifting in the wind, the stands of trees, the historic villages (almost all with a church steeple rising above the skyline) the beaches, the complex colors of the sea, and the wonderful Normandy skies. I love just letting myself go, letting my right hand take over, and then only guiding my brush when it comes to careful details, like those of the human face. But in the last few years, things have been changing. Most important, I find my groove more easily. Real often, I achieve a painter’s high, and the forms, the colors and the mixes on the canvas seem to happen in the most natural way. Of course, this comes after some years of painting, when I’ve achieved a certain level of confidence and I feel that I’ve internalized many of the painting techniques I use. And then there’s content. More and more I want to get certain ideas across. In Normandy, I remain so struck by the beauty of the landscapes that I tell myself I just want viewers to feel the same emotion I feel in painting when they look at one of my paintings. And in Philadelphia, I want viewers to feel the same emotion I feel when I see Philadelphians and new immigrants, of different cultures and colors, trying so hard to keep it all together. Now, I see these two worlds converge. This past summer, in France, I’ve starting putting more and more people in my paintings - people working or enjoying themselves on vacation. The shift just seemed so natural. And while painting these people, my painting style has remained consistent. That is, I want to represent the people in a kind of rough-hewn, free style, getting beyond the niceties of their facades to their essences. You paint both in Philadelphia and in France, can you explain your connection to France? In painting, I believe that real artists have to work hard and consistently to achieve a technical level where they can express their ideas and emotions. And the same consistent effort is necessary to achieve a level of confidence, so that when I take my brush or palette knife, I can add a strong stroke of color, without dabbing it little by little and – thereby – ruining its impact. But sometimes serendipity takes over. And that was my case a long time ago. If you were to ask me: What’s this thing about you painting nine months in the year in Philadelphia, and then the tree months of summer in France? I have to credit serendipity. It just so happens that, while in Paris a long time ago, lightning struck, and I became the husband of a French wife, my wife Catherine. From that moment on, my life became worlds more rewarding and also bi-cultural. While working in the States, we usually vacation with our children in Normandy. And during the seven years I was a reporter in Paris, we usually spent some time during the summer in my hometown of San Francisco. This connection to Normandy was a big break for my painting. I’ve been painting most of my life, earlier as a hobby and now as a profession. 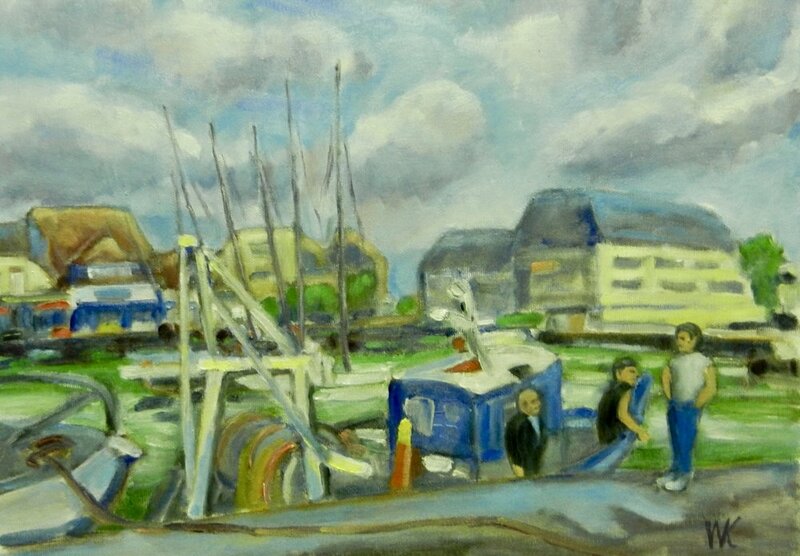 And while I worked as a journalist and later as a marketing executive, I often painted landscapes in Normandy. Frankly, my painting was okay for an amateur, but not impressive. Then, one day almost twenty years ago, Catherine suggested I try painting with a palette knife. Frankly, it was a miracle. Yes, I’m not the first artist to use a palette knife, but it transformed my painting. I mixed paint on my palette, and then I applied it directly on the canvas, most often mixing and blending it on the canvas itself. The experience was liberating. I felt a new freedom that I knew I would be able to apply to my painting in the future. I felt an ease and confidence. And, looking at the rich surface I was able to produce, I believed the palette knife was a method I could use to express the beauty in saw in Normandy. That summer, I painted about ten small paintings of specific landscape scenes, and took them back to Philadelphia. On my return, I showed them to the two partners – John and Paul – of the gallery on Philadelphia’s Pine Street, Show of Hands. They loved them, and my first gallery exhibit was a success. You take the lead on the October exhibition titled 'Hope for the Homeless', your art in support of the Bethesda Project. What is that project about and what makes that project special to you? How many times do we walk down the street in Philadelphia, and we see homeless people, sometimes with a backpack at their feet or a shopping cart at their side full of their possessions? And how many times do they hold a hand out and ask for money for a meal? Sometimes as we rush by, we don’t really pay attention to them. Sometimes we realize, ”There, but for the grace of God go I,” and give them money and tell them we hope our small offering helps. But all of the time, we know that a small contribution will make little difference in their lives and in the lives of so many other homeless people. The programs of the Bethesda Project are making a difference. Of course, one of the best places to learn about the project’s programs is on its website – www.bethesdaproject.org. As far as I’m concerned, what I find important is that the project’s programs are part of a unified strategy that includes meals, emergency shelter, but also help in finding and keeping long-term housing through rental and purchasing help, and also assistance repairing a home and paying utilities. And this help begins with individual counseling to identify underlying problems and find the best tactics to solve them. Of course, I believe that the Bethesda Project deserves our support. That’s the entire reason for my exhibit “Hope for the Homeless” at the Manayunk Roxborough Art Center. So, I definitely believe in the project’s efforts. I know that this exhibit on its own is but a small contribution. But we have to keep trying. We, as a society, have to find ways to solve the problems that continue to deprive so many people of rewarding and useful lives. Why did you become a MRAC member? Frankly, I had a very positive feeling on my first visit to the Manayunk Roxborough Art Center. The people were – and remain – warm and friendly. There’s an atmosphere of helpfulness and of camaraderie and of the importance and appreciation of art. Then, there is a small group of people who are not only prize the wide choice of programs offered by the MRAC, they actually roll up their sleeves to keep those programs running. In addition, there’s a spirit of adventure, for example a non-profit organization like the MRAC working hand in hand with anther non-profit, like the Bethesda Project. What is your best tip to future MRAC members? How can a new or current member of the MRAC get the most from his or her membership? For me, the answer is simple: Give of yourself, and you will get more than you give. Yes, there is a wealth of programs, like reciting and enjoying poetry, improving your art and exhibiting it, stimulating your ideas and benefiting from others’ ideas, and simply discussing life with other artists. But, frankly, more people have to get involved in supporting those programs. And that takes sacrificing some of your time for the greater good of all.